Full Description: Cueva Cascada is a luxury cave house in Galera, nestling literally into the side of a beautiful hill, often referred to locally as the "best cave in Galera", Cueva Cascada has been a labour of love to create. Follow the zigzag road from the village higher and higher to the top of Real Medio then you have arrived at Cueva Cascada, a place of enchantment, relaxation and excitement with outstanding views from the terrace, down the valley towards the chapel on the hill, while maintaining privacy but not isolation this is an excellent home for living, relaxation or entertaining. Fully fitted the feature bathroom has a waterfall cascading down a rock face (operated by hot and cold taps) into the large bath, it is this waterfall that gives our home its name, (cave waterfall) complete with mixer shower taps, a separate tiled shower area, vanity unit with mirror, 3 single spot lamps above, twin sinks set into a blue granite top, tiled splash back with ample storage cupboards beneath, white WC and Bidet, complimented by low energy LED lighting operated with motion sensor, and five fitted wall lights. Entering from the hall through a wooden / glass door down two steps is the large double bedroom with built in illuminated wardrobe, tiled on-suite wet room and feature nook illuminated with LED lighting traditional wall lights makes this a perfect Master bedroom. The heart of the cave home is fitted with a central marble fireplace complete with a highly efficient Norwegian Dovre wood burning stove, a recessed LCD TV is part of the concealed multi-media system which includes a cinema surround sound system, DVD player, satellite reception, internet, router and telephone. Ample power points are installed around the room, with feature traditional wall lighting. Double-glazed window with shutters providing natural daylight to the room. A step leads to the kitchen / dining area. Leading from the lounge this large double bedroom complete with walk in raised wardrobe and recessed features is again fitted with ample sockets and matching wall lights and tiled floor. Leading from the lounge is the raised kitchen, also the second entrance door to the property via three steps leading from the Patio. Fully matching floor tiles and feature wall lights the kitchen was recently refitted with the addition of motion sensor lighting including floor level LED lights, feature LED lighting and task spot lighting all selectable for your desired combination. An efficient illuminated extractor hood is fitted above the electric hob, (with oven below) which is installed into the granite worktops with pale green glass tiled splash backs, stainless steel sink with mixer tap, built in fridge-freezer and a range of quality hand made base units which offers ample drawers and cupboards. Leading from the kitchen is bedroom three, again complete with walk in wardrobe, recessed features and wall lighting. This room has a beamed ceiling and is at present used as a twin but can easily take a double or be used as a dining room. The entrance indicated by the solar powered illuminated landmark gatepost, down the drive to a gravelled area used for car parking. A dwarf white painted wall surrounds the boundary topped with traditional tiles. Entering towards the cave hidden from the road you will see many features far too many to mention them all but including the large wood store, shaded pagoda (with seating and storage) and central planter complete with water feature and bird table, rockery and BBQ situated on the shaded raised patio area used for dining. 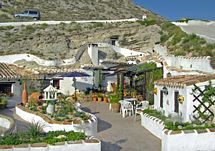 Many low maintenance beds and pots add to the traditional Spanish Mediterranean garden atmosphere enhanced by the sound of running water. The garden and pots is fully fitted with three independent fully automatic watering systems, with drippers, leaky pipe, and mini spot sprinklers. 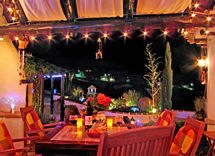 The garden also incorporates a complete mood lighting system great for entertaining friends at intimate dinner parties or for larger gatherings of over a hundred people with several local bands. The imaginative exterior lighting (famous locally) includes many low energy, solar and LED lights, Blue or white Mini LED lights are installed in many of the perimeter walls, feature spots illuminate the plants and statues, and underwater LED lights illuminate the water feature while dimmable traditional lanterns are fitted around the property giving a golden glow to the terrace. Floodlights are also installed to illuminate the rock face above the cave when required. Lighting is fully controllable with dimmers, motion sensors and photoelectric cells to keep energy consumption to a minimum. Sunbeds, parasols, tables/chairs, pagoda and dining furniture ensure that you can relax in the shade or sunshine in different places in this west facing home, enjoying stunning sunsets or stargazing with a glass of wine on the terrace. Cave homes maintain a constant temperature throughout the year between 18-22 degrees no matter what the temperature is outside so no need for air conditioning. Heating is provided with two fitted thermostatically controlled electric radiators and a large Norwegian Dovre wood/multi-fuel stove in the lounge for extra warmth in the winter if required. Water is heated with a fitted thermostatic electric water boiler mounted in the utility area of the hall. All wooden windows (Kitchen, Lounge, Hall and Bathroom) are double-glazed, complete with fly screens and fitted with shutters for privacy. Windows are also fitted with the traditional window bars so windows can be left open when the property is unoccupied. The entrance doors are each fitted with security locks at three points. An intruder alarm system and smoke detectors are also installed in the cave. Fully tiled matching ceramic floor throughout the property. All lighting features traditional wall mounted (Dimmable Low energy lighting) dimmers are fitted in all rooms, along with many automatic motion sensors and the latest LED lighting, ample power points are fitted around the home, along with automatic emergency lighting units which switch on in the event of power failure. Internal doors are wooden with four panels of frosted beveled glass; all bedrooms also have privacy blinds fitted to each door. Electricity, Water, Internet, Telephone and Satellite dish are all installed, along with mains sewerage. Mobile Telephone reception for most networks is available in Galera, however due to the thickness of the walls in the cave home mobile phone reception is at its best in the hall. Fully furnished with purpose build traditional style Spanish furniture that is available if required along with all other fixtures and fittings at an addition cost to be agreed. Extractor fans are installed in all bedrooms, and a cooker hood extractor is installed above the ceramic hob. Outside feature lighting is fully automatic with lanterns, concealed LED lamps, spotlights, dimmers, motion sensors, photoelectric sensors and solar lights giving outstanding mood lighting for the evening. A Fully operational economical automatic watering system is installed throughout the garden / pots so no need to worry about watering the garden in the summer if away from home. Easy walking distance to the Spanish village of Galera where you will find a weekly market, variety of shops, banks, bars and restaurants along with the village hotel and swimming pool. This is a unique environmentally friendly property, in an outstanding location. Superb as your permanent home, or a holiday escape when time permits, so you can relax and enjoy all that Andalucia has to offer. What are you waiting for, escape to the country and start you new life in the sun!! This listing has been viewed 23071 times.